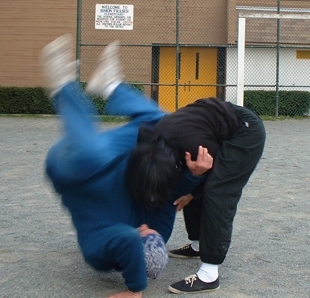 The martial art Meihuazhuang maintains a vital presence on the West Coast. 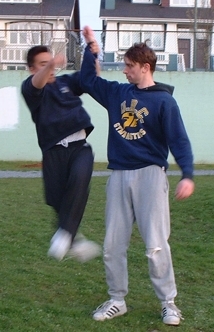 Building on the transmission of martial theory and skill first charged to Canadians in the early 1990s, members challenge each other to develop abilities proven to enhance health, spontaneity of movement and self-protection. The Vancouver group is led by Alice Lee, direct student of Master Yan Zijie and cofounder of the Canadian Association. Providing instruction on punching, kicking, grappling and evasive techniques, Ms. Lee leads dynamic practices that incorporate rigorous body conditioning with meditative postures. The club draws its membership from across the city and offers an invitation to all who are interested in learning more about the art. For more information and to confirm practice times and locations, please contact the Canadian Meihuazhuang Association. Posing after practice. Irene Terashimi, Denise Wood, Ray Ambrosi, Erin Mazur, Jeff Quinn. Regina, 2005. 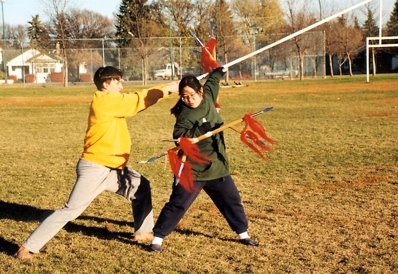 The Canadian Meihuazhuang Association is pleased to have been teaching martial arts at University of Regina since 1993. A regular part of campus life for many years, the group has offered many programs and lectures to a generation of university students. Chris Leurer & Ireme Terashimi practice weapons. 2001. The establishment our meihuazhuang website in 1994 marked the first English language introduction of the Art. 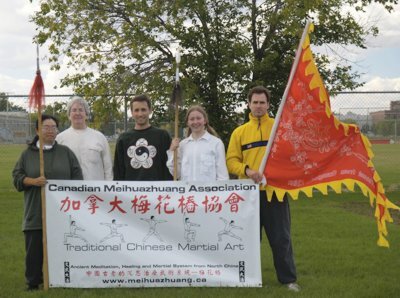 In the years since, the Canadian Meihuazhuang Association has worked to introduce the style to the public and record the remarkable health benefits and self-defense skills that are the result of regular practice. The group has performed at many community events and public celebrations, participating in martial arts demonstrations at international celebrations such as "MOSAIC" and Chinese new year celebrations.